"Heartbreaking… Unexpected and refreshing… I won't give away of the surprising twists and turns that The Guest Room takes on the path to Bohjalian's daring conclusion; I'll only note that much of the pleasure that comes from reading any well-constructed narrative lies in trying to anticipate how the author will write himself out of seemingly inescapable corners. But here, for a change, we also have a novelist who seems more concerned with examining and dramatizing a much more universal question: whether, in the end, any amount of love or compassion, retreat or nobility or forgiveness, can overcome the remorseless workings of evil." "The Guest Room [has] an edge-of-the-seat momentum that propels the reader straight to the last page... For those who value the well-researched novel, the author's 18th book will please… Promises to enlighten and entertain." “Within the first few pages of The Guest Room, the latest novel by prolific author Chris Bohjalian, the booze-fueled bacchanalia that began as the fulfillment of men’s fantasies turns into a Helter-Skelter-like nightmare… Bohjalian, whose books often explore the contrast between surface lightness and the darkness that lies below, takes on upper-middle class America in this novel, ripping apart any illusion of safety or moral high ground in a headlong collision between the comforting rituals of suburbia and the viciousness of the Russian mob… [Bohjalian is] at his best in The Guest Room, one of his most compelling books so far, combining an explosive premise, a timely social topic, and fast-paced storytelling with a purpose." "The book's real throbbing heart is Anahit, an aspiring young dancer from Armenia... The narrative's frequent somersaults from Anahit's devastating backstory to the Chapman family's more sheltered world is a remarkable artistic feat. . .a steely exploration of the very human cost of bachelor parties and other games of male pleasure." "A story both global and intimate… Heartbreaking." "Well-written and psychologically astute... Alexandra is the conscience in this conscienceless world, a girl who manages to hold on to her innocence and compassion despite the horror of her life. Her voice, with its sometimes uncertain, quirky English, is rendered with such perfection that it’s easy to forget that the author is male. This, the book tells us, is what happens to the innocent... Enjoyable." "Hard to put down... Chris Bohjalian keeps readers turning each page... painfully honest... compelling." "Superb...a stark reminder of the consequences when perhaps we don't listen to our better angels." "Suspenseful… It took all of our willpower to not bite off all of our nails as we tore through this dark thriller." "The Guest Room pulses quick as a page-turner, but its concerns run deep into the moral consequences following an eruption of violence in ordinary lives." "Bohjalian catches a key social moment with a book that's fresh and different... a tale of scandal, shame, and escalating suspense." “Reads like a thriller...I did not see the end coming. Chris does a terrific job of exploring the very dark side of traffickbing and the women who are preyed on...Lots to discuss, and book clubs should take note." 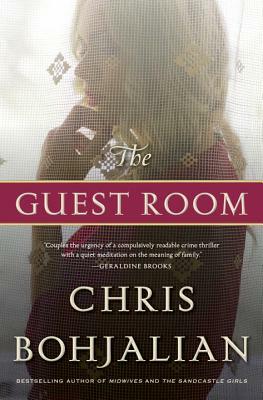 "The Guest Room is a page-turner in every sense of the word. From its very first page to an emotionally charged surprise ending, Bohjalian's fast-paced plot draws readers in and makes the book truly 'hard to put down'...Remarkable... A captivating and insightful read."